by Chris Guld, www.GeeksOnTour.com Aren’t digital cameras great?! Just snap away to your heart’s content, no worries about wasting film, or costing more money, or taking up more space. You can see right away if you captured the image you wanted, and take more shots if you didn’t. I’ve been known to take over 100 pictures in any given day when we’re traveling thru beautiful countryside. For RVers, like us, you can quickly rack up thousands of pictures! If you put your pictures onto your computer, which we think you should, then you have lots of choices for what software to use for managing and editing them. At Geeks on Tour, we’ve been evangelists for Picasa over 7 years now. It’s a free program that you download to your computer from Google. We teach several seminars on it, produced over 60 tutorial videos, have a website dedicated to Picasa, and wrote a book on it! But, we know it’s not the only game in town. Many people with Macintosh computers are very happy with iPhoto which comes preinstalled on their Macs – even though Picasa does have a fully compatible Macintosh version. On Windows computers, the gold standard photo editing program is Adobe Photoshop ($700!) 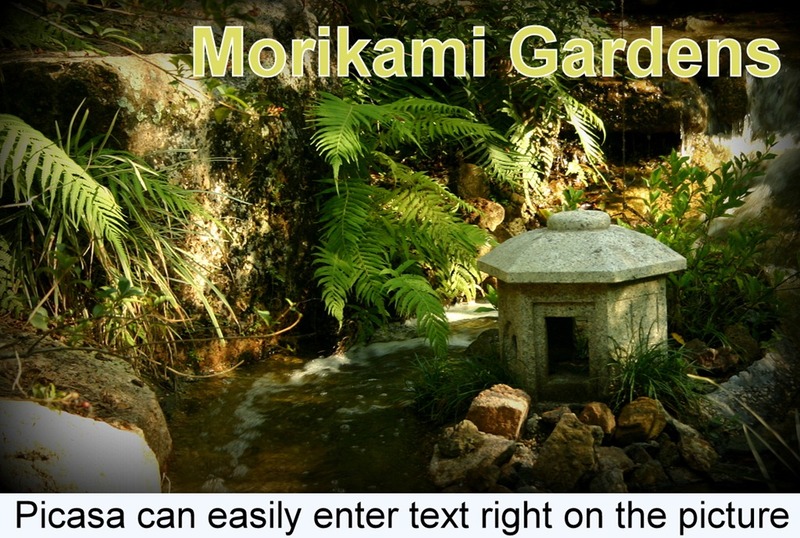 or Photoshop Elements ($99.) There are also several free programs, including Microsoft’s offering – Windows Live Photo Gallery, and a full featured, Photoshop workalike called GIMP. As you can see from the crowd of over 700 people in one of our Picasa Seminars for FMCA, Picasa is very popular. The free price certainly has something to do with that, but Picasa also gives you the greatest capability for the least effort. When we started teaching Picasa about 7 years ago, it was drop-dead easy. Over the years, Google has added more and more features. Some areas have now become a bit complex, but it’s still pretty darned easy, especially compared to the full-featured image editors like Photoshop or GIMP. Before Picasa, I used a program called Fireworks – generally in the same class as Photoshop. It would take me 1 – 2 hours every time I went thru my process with the day’s 50 or so photos, when I switched to Picasa, the time shortened to about 15 minutes! The closest competitors to Picasa in ease of use are iPhoto and Photo Gallery. They even have some features that are an improvement over Picasa. iPhoto gives you multiple ways to view your pictures in location on a map, better slideshow features, and built in ways to make cards and books. Photo Gallery has that cool photo fuse feature where you can replace one person in a group shot, it has a Panorama feature that Picasa lacks, and I like the way tags are handled better in Photo Gallery. I actually considered switching to Photo Gallery but then realized that I simply could not live without Picasa’s features of Text on photos, or combining pictures in a Collage. And Photo Gallery as well as iPhoto only have a fraction of Picasa’s photo editing features. I have so much fun just trying all the different single-click effects, then undoing them if I don’t like it. What about Flickr, or Snapfish, or SmugMug? I talk to many people who say, ‘Oh, I don’t use Picasa, I use Snapfish.’ They don’t understand. Picasa is software on your computer for working with pictures on your computer. No Internet involved. Flickr, Snapfish and SmugMug are photo sharing websites. Google also offers a photo-sharing website called Picasa Web Albums, but Picasa and Picasa Web Albums each can stand on their own without the other. So, “I don’t use Picasa Web Albums because I use Snapfish.” would make sense, but I would still ask them what they use to edit their pictures on their computer. Maybe they use nothing – just copying the pictures from the camera to their computer, then uploading them directly to Snapfish. Oh what they’re missing! Google is going thru a lot of transition these days, with their social network – Google + – leading the pack. They made an announcement a few months back that Picnik is closing on April 19. Picnik was an online photo editing website that Google bought last year. They linked it to Picasa with a button along with Picasa’s main editing tools. Now they’re taking it away, and that is starting a lot of rumors about the future of Picasa. Many of the cool photo editing tools that were developed at Picnik are now incorporated directly into Picasa 3.9, and many more have become part of the online photo editing available thru Google Plus. The Picasa desktop product is still very strong at Google. Google is certainly not above killing product lines, but they do it with failures, not stars. That said, Picasa may very well be renamed to Google Photos. It’s certainly appropriate that a star product be recognized by the company’s brand – and I wouldn’t be at all surprised if they used the April 19 date to make that happen. If that happens, I sure hope they do something to distinguish between the online photo-sharing software and the desktop photo management software. Over and over again, I ‘ve had to explain the difference between Picasa (desktop software) and Picasa Web Albums (online photo-sharing.) It would be even worse to have Google Photos (desktop software) and Google Plus Photos (online photo-sharing) !! The Best Software is the One you Know How to Use! The bottom line with any computer software is knowing how to use it. You’ll accomplish a lot more with a half-good program that you understand, than with the cream of the crop that you can’t figure out. I’ll keep using – and teaching – Picasa because I understand it inside and out. Whenever they come out with new features, like the side-by-side editing introduced in version 3.9, you can count on new videos like the one -below from GeeksOnTour. 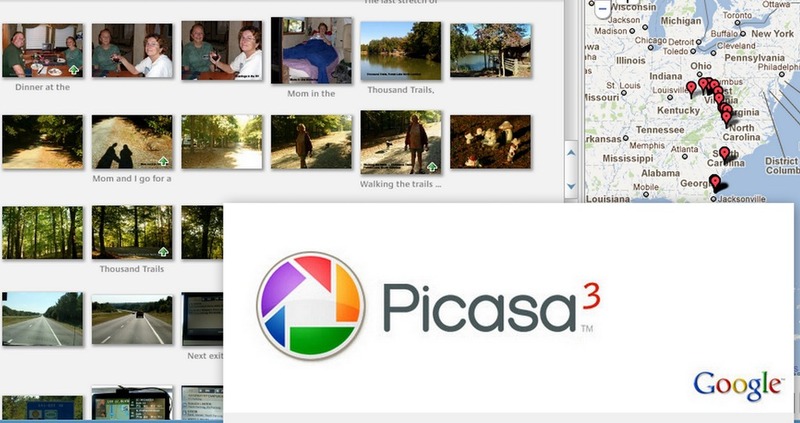 Sign up for our free Picasa Tip-of-the-Week if you want to stay on top of all things Picasa! Published by MrsGeek, in Blog. Tagged with Google Photos, iPhoto, Photo Gallery, Picasa, Picnik, the best photo software. Yes Google PLEASE don’t loose Picasa. I love it and since having it I rarely need anything else. The only thing I miss in it is to darken highlights and lighten shadows and maybe selections. I dip into Photoshop for that. I share Picasa to my U3A Camea group and even folk who are not big into editing can take it in as they find Photoshop a bit overfacing. They are staggered as to how easy Picasa is. So PEASE don’t loose it, go on developing it. Add Google to the title if you want but please leave the word Picasa in there somewhere. Anyway if Google does change Picasa’s name I hope they keep the name alive somehow. When making and editing collages I find it’s very much like painting a picture and I try to convey that to the students. Google, please don’t let Picasa get swallowed up in the sea of obscurity and anonym’ty.!! It would be a shame if the Picasa identity is lost. It is well known and loved by all who understand it. I have taught Picasa for 3-4 years to Seniors and privately at home) AND EVERYONE LOVES IT. The name is spreading and more and more people want to learn. It is a beautiful program but it has to be learnt. There’s plenty I don’t understand about the in depth technicalities but by reading the forums and The Geek’s newsletters I keep learning what’s important to me so I can pass on more info to others.